Maxis prepaid brand Hotlink has just introduced its new Prepaid Broadband service that offers download speeds up to 42Mbps. This replaces Maxis Prepaid Broadband that offer speeds up to 7.2Mbps. 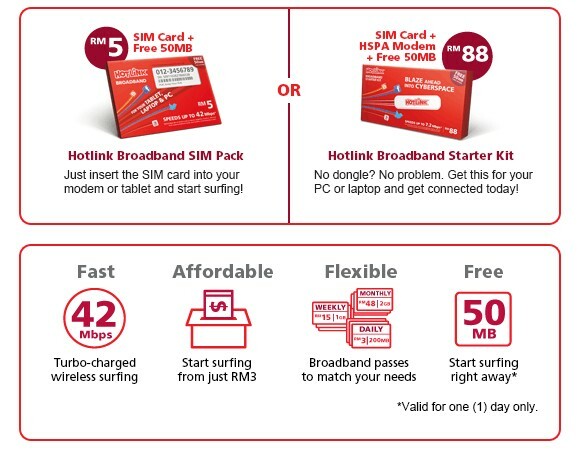 The new plan comes in a SIM pack at RM5 and a complete Hotlink Broadband Starter kit that comes with a HSPA modem for only RM88. Both packages come preloaded with 50MB of free data. Existing Maxis Prepaid Broadband users are automatically converted to this new Hotlink Broadband plan effective 8th August and shall also get to have uncapped speeds up to 42Mbps. In terms of speed, it varies on coverage and device. The bundled modem in the Starter Kit isn’t a HSPA+ variant and supports up to 7.2Mbps. It comes covered with a 12 months warranty. To get the most out of Maxis HSPA+ network, you would need a HSPA+ modem which is sold at RM280 at selected Maxis centres. If you plan to make calls and SMS, it does allow you to do so at 36 sen/min and 10 sen per SMS. Hotlink Broadband is an affordable broadband option especially for travellers or those looking for an alternative wireless broadband for short term use. The wide range of broadband passes offers is certainly welcome to suit various usage. For more information, head over to Hotlink Broadband page.